New reports that President Donald Trump repeatedly discussed with advisors his conviction that the United States should leave NATO represent nothing short of a triumph for Russian national security policy — even if nothing definitive has happened (yet). 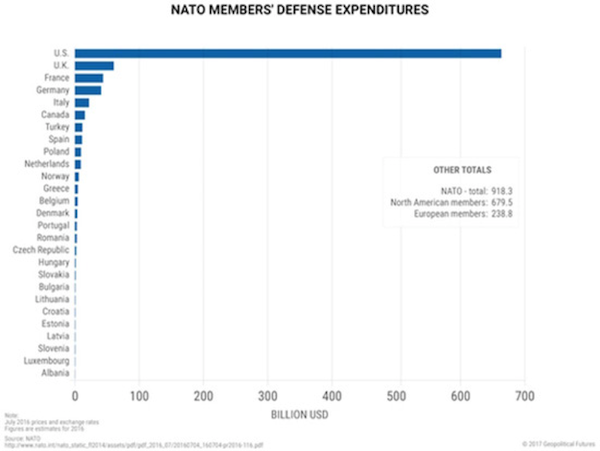 The U.S. currently spends roughly $700 billion on its defense (4 percent of GDP), and the combined spending of the other 28 NATO members is about $300 billion. The end of the American nuclear guarantee might also encourage several European countries to create or expand their nuclear forces and embolden broader global proliferation. Donald Trump has objected to NATO and lack of European military spending in the past, so it is no surprise if he did it again. The USA does spend about twice as much on its military than all the other NATO nations combined–and combined they have a larger economy than the USA. Donald Trump’s view on that has some materialistic validity. However, that being said, this latest report will has cause even more uncertainty within NATO. Things will change with Europe. Europe will spend more, and the USA will not like how that will end. Since Donald Trump’s election, many leaders in Europe have publicly stated that Europe must defend itself. And Europe has taken steps. The PESCO scheme, an acronym for Permanent Structured Cooperation, involves 25 armies working with one another. One such project, adopted in late November, involves France, Belgium and Cyprus developing a Beyond Line of Sight Land Battlefield missile systems family. Another project, adopted in March last year, involves Greece, Italy and Slovakia developing and building a prototype European Armoured Infantry Fighting Vehicle. You may wish to consider PESCO the EU’s alternative to NATO. The Bible shows that Europe will end up with “a great army” (Daniel 11:25). Partially because of Donald Trump, various ones in Europe have taken some steps and agreed to take more responsibility for defense (e.g. PESCO: EU’s alternative to NATO? and Europe moving towards its own army ‘Europe may soon produce its own Trumps’ and With PESCO, EU entering a ‘New Era’: An era that will NOT end well for the USA, Canada, or the UK). Many see this as reasonable and logical–particularly in the light of real and alleged comments from US President Donald Trump. Yet for now, while Europe may appear to be supportive of NATO, in the end Europe will betray the NATO members of the USA, Canada, and UK. The above leader is the final European King of the North Beast power. He will eliminate the USA and the UK. It is likely that he may attack under the guise of a NATO exercise and/or otherwise feign military support for the USA and the UK. Regular readers of this page realize I have been warning about this for many years. 6 … But the calf of Samaria shall be broken to pieces. The reference to ‘Samaria’ above refers to the USA (see Spiritual Samaritans: Old and New) and the reference to Ephraim above refers to the UK, Canada, Australia, and New Zealand (for biblically-related details, check out the article Anglo – America in Prophecy & the Lost Tribes of Israel). Assyria is a reference to a European power based out of central Europe (for biblically-related details, check out the article Germany in Biblical Prophecy). Europe will need to reorganize, but the Bible tells of at least two more reorganizations to come in Europe in Revelation 17:2-13 (see also Must the Ten Kings of Revelation 17:12 Rule over Ten Currently Existing Nations?). Europe is moving in a military direction and Donald Trump is encouraging it. While Barack Obama and Hillary Clinton also encouraged this, their presence and rhetoric simply did not resonate with the Europeans as much as Donald Trump’s has. The Bible shows that the European power (called Assyria in Isaiah 10; see also Germany in Biblical Prophecy) does not think it intends to be militaristic, but that it will and will conquer. The Bible shows that the world will marvel that Europe was able to be such a military power as Europe basically had been dismissed as irrelevant. That will be the end of NATO and the USA. For those that think this could not happen to the USA, recall that Daniel 11:39 shows that a European power will destroy the ‘strongest fortresses’–which in the 21st century belong to the USA, this shows that the USA will be defeated, despite its military strength (see also USA in Prophecy: The Strongest Fortresses). Europe is taking military steps and the USA is encouraging them. This will not end well for the USA, many Muslim countries, nor even Europe (cf. Daniel 11:39-45; Revelation 17:14). Russia is another matter (see Russia and Ukraine: Their Origins and Prophesied Future). Does God Have a 6,000 Year Plan? What Year Does the 6,000 Years End? Was a 6000 year time allowed for humans to rule followed by a literal thousand year reign of Christ on Earth taught by the early Christians? Does God have 7,000 year plan? What year may the six thousand years of human rule end? When will Jesus return? 2027 or 20xx? There is also a video titled The 6000 Year Plan: Is the end of humanity’s reign almost up? Here is a link to the article in Spanish: ¿Tiene Dios un plan de 6,000 años?The Gospel of the Kingdom of God was the Emphasis of Jesus and the Early Church Did you know that? Do you even know what the gospel of the kingdom is all about? You can also see a YouTube video sermons Why Teach the Kingdom of God, The Gospel of the Kingdom, and The Kingdom of God is the Solution. This entry was posted on Thursday, January 17th, 2019 at 8:00 am	and is filed under Prophecy.